Hephaestus arma Achillis Theti dat. Cylix Atticus, 490–480 a.C.n.. Museum Vetus Berolini. Hephaestus in fornace. Sculptura a Gulielmo Coustou minore facta. Hephaestus ab Andrea Mantegna pictus. Templum Hephaesti Doricum apud forum antiquum Athenarum. Facies occidentalis templi Hephaesti Dorici apud forum antiquum Athenarum. Vulcanus, Romanus Hephaesti par, arma Achillis Theti dat. Pictura a Petro Paulo Rubens picta. Thetis arma Achillis ab Hephaesto accipit. Ab Antonio van Dyck picta, 1630-1632. Hephaestus (Graece Ἥφαιστος) est deus Graecus ferrariorum fabrorum, artificum, opificum, sculptorum, metallorum, metallurgiae, ignis, et montium igniferorum. Eius par Romanus est Vulcanus. In mythologia Graeca, Hephaestus est filius Iovis et Herae, regis et reginae deorum; ille autem in alia fabula est parthenogenus Herae filius, a matre ob deformitatem reiectus et de Olympo monte deiectus. Hephaestus ferrarius deorum faber arma deorum Olympiorum conficit. Colebatur in Graecis fabricatorum et industriae regionibus, praecipue Athenis, eius cultu in Lemnos condito. Eius signa sunt malleus, incus, forceps. Bowra, C. M. 1957.The Greek experience. The World Publishing Company. Burkert, Walter. 1985. Greek Religion. Dolmage, Jay. 2006. "Breathe Upon Us an Even Flame": Hephaestus, History, and the Body of Rhetoric. Rhetoric Review 25(2):119–140. doi:10.1207/s15327981rr2502_1. Graves, Robert. 1955. The Greek Myths, vol. 1. Harmondsworth Middelsexiae: Penguin Books. Graves, Robert. 1960. Greek Gods and Heroes. Dell Laurel-Leaf. Harmon, A, N, 1912. The Paintings of the Grotta Campana. American Journal of Archaeology 16(1):1–10. Kerenyi, Karl. 1951. The Gods of the Greeks. Saggs, H. W. F. 1989. Civilization Before Greece and Rome. Portu Novo Connecticutae: Yale University Press. ISBN 0300044402. Silver, Morris. 1992. Taking Ancient Mythology Economically. Novi Eboraci: Brill ISBN 9004097066. Webster, T. B. L. 1958. Some thoughts on the pre-history of Greek drama. Bulletin of the Institute of Classical Studies 5:43ff. Vicimedia Communia plura habent quae ad Hephaestum spectant. 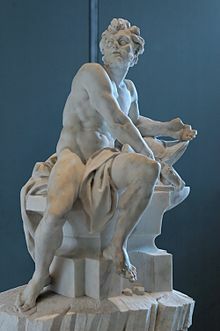 Hephaestus in litteris et arte classicis. Propositum Theori. Novissima mutatio die 31 Decembris 2016 hora 01:43 facta.